Here is a really cool technique that Leo Hans suggested to me a long while ago. I finally had time to figure this out. 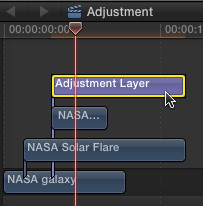 An “adjustment layer” is an object on a higher layer which, when an effect is placed into it, affects all the clips below it. Adobe first presented adjustment layers in Photoshop, then extended them to Premiere Pro somewhere around the Creative Cloud release. 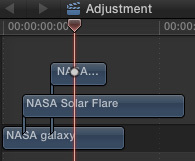 They are very helpful because it means we can add an effect to a single “clip” that affects everything below it. 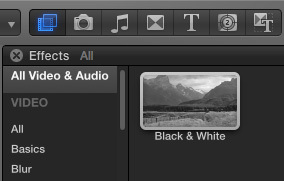 Final Cut Pro X doesn’t have them… but, you can fake it. This article explains how. The easiest way to create this effect is to use Motion. 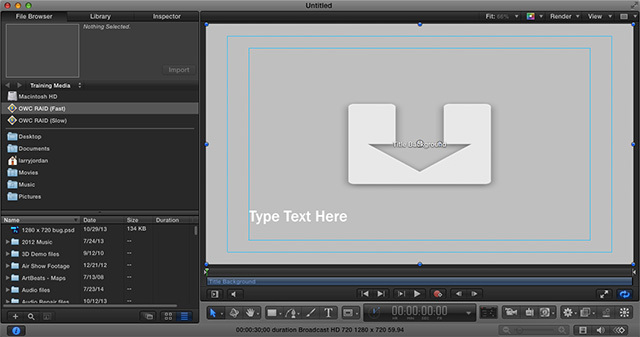 Motion opens, displaying the standard title creation template. 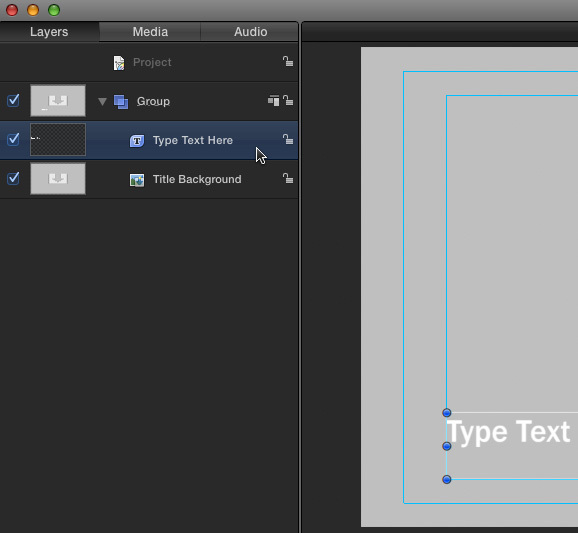 Open the Layers panel (shortcut: F5), select the text layer and delete it. This is the only change you need to make. Choose File > Save As, then give the effect a name. 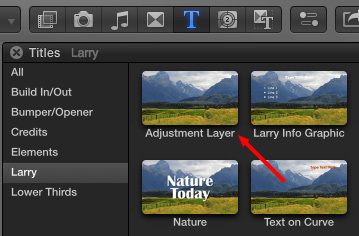 Here, I’m using “Adjustment Layer” and storing it in a custom category named “Larry.” You can name this effect anything and store it in any category you prefer. I just like being obvious so I can remember what I did and where I put it. I’ve found, when I create new templates, that FCP X does not always know something new has been created. So, if FCP X is running, I generally quit and restart it. That way, it refreshes the list of templates available in each browser. When I select the Larry category, the Adjustment Layer effect is visible in the top left corner. That looks like this in the Viewer. 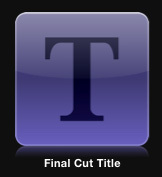 Drag the Adjustment Layer effect from the Titles Browser and put it on TOP of all three clips. Adjust the length of the Adjustment Layer clip to run whatever duration you need. Now – and this is the magical part – add any effect to the Adjustment Layer and it will automatically apply to all the clips below it! This is the result. 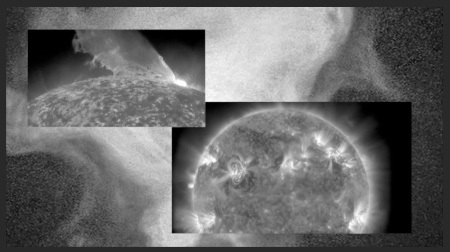 ALL the clips below the Adjustment Layer effect now inherit the Black & White effect. NOTE: This technique works for any effect – including Broadcast Safe. In fact, using this Adjustment Layer effect for the Broadcast Safe effect is faster and more flexible than combining all your clips into a compound clip. This is a very fast, very easy technique to use whenever you want the same effect to be applied to multiple clips. And, I am totally blown-away by how fast and easy this makes using the Broadcast Safe effect to prevent excessive white levels. Why don’t you update this to say that FCPX does have Adjustment layers, but if you want to make your own, here’s how. I have not noticed that FCP X has adjustment layers. Where are they? Very interesting – thanks for letting me know. Indeed. I’m running 10.4 as well and don’t see Adjustment Layers in Title > Adjustment Layers. 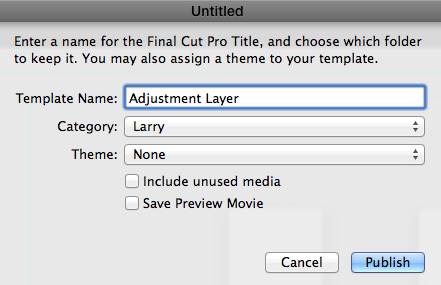 Various 3rd-party developers supply Adjustment Layers for FCP X. Apple does not. Adjustment layers do NOT come with 10.4. What you’re seeing was likely installed before your update. That is a good thing to know. I test so much software that sometimes I forget what was part of the original installation. In which case, this article explains what you need to know to create an adjustment layer. There is a much simpler solution. Select all the clips for which you want to apply an effect – could be the whole project/sequence. Turn these clips into a compound clip (right click or menu). You can then apply any effect to the all the clips at once – now shown as a single clip. You can still break apart the clips and work on them, then return to the compound version. I found this in Lynda.com training. Having used Premiere Pro extensively I have switched to FCPX. I find that it’s a different way of thinking about things, but now that I am getting used to it I find it quicker and much better. I would argue that this is a very cumbersome method, and not ideal for many situations. Yes, nested compound clips are fantastic, but depending upon what you’re doing, can easily be a big nuisance. In Premiere and AE, I use both nested sequences and adjustment layers, about equally, depending on the situation. But they are no replacement for each other. There are also many situations where an adjustment layer can do things nesting can’t. What happens when you need to automate an effect over multiple clips and still need to access the clips for timing over audio? Suddenly nesting becomes a nightmare. Nesting is great, Adjustment layers are great, but they are NOT substitutes for each other. Thanks Larry, but as Stuart says I can’t see the advantage of the ‘faked’ adjustment layer over using a compound clip, nor am I missing something? The big advantage to an adjustment layer is that you don’t need to switch between going inside a compound clip to adjust an edit or level, then back out to the compound clip to adjust the effect. It can be a faster way to work. Agreed. Both Nesting and Adjustment Layers are very powerful workflow techniques, but they’re very different, and in more complex situations, one will have clear advantages over the other. I use both constantly (been in the video production biz for about 15 years). Adjustments are very simple, maybe not quite as powerful, but if they provide exactly what you need, they are much more immediate to automate and work with when juggling clips in a larger project. Generally I’d rather use Adjustment Layers whenever possible unless they don’t give me the control I need. It’s much easier to make creative decisions in one timeline than two or more. Photoshop and AE have had them for decades, Premiere for about 5 years, once you start using them, you’ll quickly realize how amazing they are. Good conversation, I have a similar issue with Key Frames, I have a background image and several text images and I want them to move in unison from a point out of the viewer to cover approx 30% of the frame., I ended up setting a key frame for each object, so I have key frames for the three text objects and one for the background ( usually a white or blue background. Getting each of these to have the correct starting point and appear to move in unison and end in unison is a challenge. My sense is that once I get these items in unison, I should make a compound clip in order to reuse it and protect it from inadvertent mouse clicks or mouse movements. I would flip your thinking. Create the compound clip first, then apply your movement keyframes to the compound clip. MUCH easier. Also, perhaps it’s too simple a question but what do you mean ‘use Motion’? I haven’t a clue what that refers to! 😛 Could you elaborate, please? The phrase “use Motion” refers to using the application Apple Motion to create effects – such as an adjustment layer – for Final Cut Pro X. Motion is sold separately from Final Cut Pro X by Apple in the Mac App Store. Adding a LUT should not change clip speed. Ever. However, LUTs are applied to clips, because they can vary by clip. Just as you can use shots from different cameras in the same timeline. Unlike an effect, LUTs adjust the value of pixels before they are displayed in the Timeline. I would not recommend applying LUTs to adjustment layers. I thought balancing exposure and colour and then set the Lut via adjustment layer to get a uniform look to all the clips in the timeline is the way to go. So its better to apply the Lut to each clip individually?